A fuel injector is made up of a number of components including the solenoid, fuel filter, plunger, valve spring and spray tip. 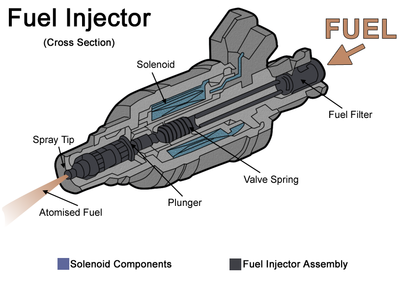 The fuel injector is the component of the vehicle that delivers the exact amount of fuel to the engine that is needed. There are many types of fuel injectors. Below is an example of the cross-section of an injector. Fuel injectors delivers the exact amount of fuel that is required to the engine. When working at optimum capacity they will help provide optimum fuel capacity, and will prolong the life of your engine and vehicle. The vehicle will perform better. Why Does My Fuel Injector Need Cleaning? Even a small amount of dirt inside the injector, or carbon build up on the tip of the fuel injector, can cause improper delivery of fuel to your engine. As with all vehicle parts having your injectors cleaned and regularly maintained will prolong the life of your injectors and other key components of your engine. This includes oxygen sensor and catalytic converters. Your vehicle runs better, lasts longer and uses less fuel. Cleaning your fuel injectors keeps your vehicle’s engine maintained and running smoothly. Having your fuel injectors serviced and cleaned on a regular basis saves you time and money. How Do I Know When My Injectors are Due for a Professional Clean? What is You Send It We Clean It? Our You Send It We Clean it service enables you to have your injectors professionally serviced by us quickly and easily. We offer free return postage Australia wide and injectors are posted back to you within 24 hours of receiving them.